Rage , the latest shooter from id Software, will be released on October 4. Both Tim Willits and Matt Hooper got their start in game design as fans, creating maps for id Software games like Doom and Quake. Now, as the studio celebrates its 20th anniversary this year, both are working on the studio’s upcoming post-apocalyptic shooter Rage. It’s a game that not only represents id’s first new franchise in quite some time, but a culmination of two decades of first-person shooter design. Willits, now id’s creative director, began modding maps for the first two Doom games back in college. He would actually daydream of working at id during the commute to class. Hooper, now design director, had a similar experience, though he worked on Quake maps in lieu of engineering homework. Eventually, both were noticed and hired by the powers that be at id. Both have since risen from modders to prominent leaders within the studio. The process is different in a lot of ways, and comes with more stress (“I have a lot less hair,” joked Willits). There are also quite a few similarities. When Hooper used to sneak away from his textbooks to get in some Quake modding time, it wasn’t all that different from now, when he has to focus on the management of the company while at the same squeezing in time to help create a new game. Of course, that’s not all that’s changed. Since the release of Doom 3, the studio has grown significantly. Around 60 core developers are working on Rage, three times as many as on Doom 3. Even fewer worked on previous games. On the technical side, the team is also dealing with multiplatform development for the first time, as Rage will be available on the PlayStation 3 and Xbox 360 in addition to the PC. Prior games were developed on the PC and ported to consoles, not developed simultaneously. id is known for pushing the technical boundaries of modern PCs, but with id Tech 5, the technology that powers Rage, the focus was a little different. The team has attempted to make the game playable for more people but still maintain the technical prowess that id is known for. Over the course of its existence, id has become known primarily for its work on three different franchises: Doom, Quake, and Wolfenstein. Rage represents the chance to do something new. This let the team play around with ideas that might not fit within games where fans already have expectations, but that might work in a new universe. Early on, though, what that universe was wasn’t exactly clear. Eventually the post-apocalyptic world was fleshed out and expanded. During the course of development, games like Fallout 3 and Borderlands were released, which drew immediate comparisons. “I get a giggle out of [the comparisons] because of course we had no idea [those games were in development],” said Hooper. 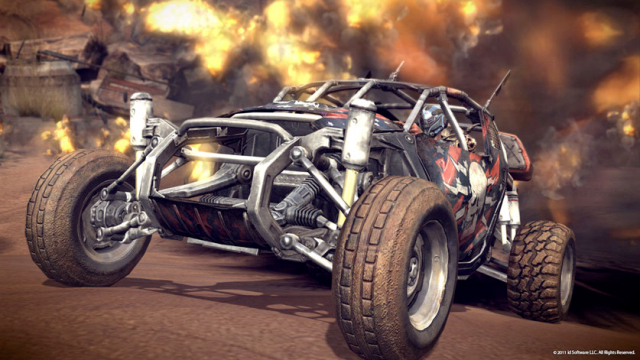 Instead, the Mad Max-style was chosen as a “grand excuse to twist the world in a way that’s different.” It’s a near-future world full of mutants and different factions, which allowed the team at id to expand the gameplay in a number of ways. 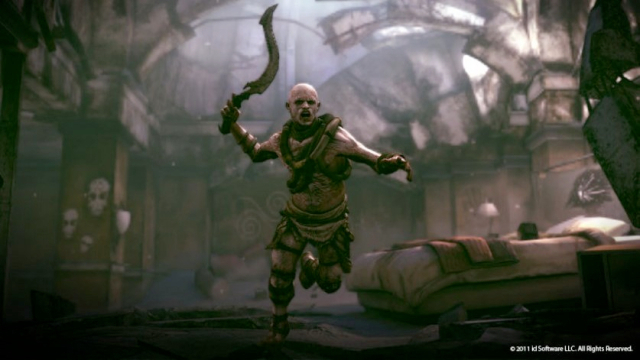 In addition to its core shooter gameplay, RAGE also has RPG-style elements. You can customize your character with new weapons and gear and there are towns where you can talk to people and learn more about the world. The expansive wasteland also led to another new concept for an id game: driving. Although, as Hooper explained, this feature still isn’t far removed from id’s shooter roots. “I don’t think we thought it veered too much from the shooter fundamentals because you still have a weapon on the vehicle, you buy new armor for it, you press a button, you fire a weapon, and you have some rewarding feedback on the other side,” he told Ars. “And that’s kind of the fundamentals of a shooter. It’s all about hitting a button and having something cool happen. “I’ve described it as the horse in Zelda. You ride your horse from one place to another and the world seems more believable than just a standard corridor shooter where you go from point A to point B and then there’s a door and you load the next level,” Hooper said. Though the team is still focused on launching Rage at the moment, which will include creating post-release DLC based on player feedback, the ultimate hope is that like Doom and Quake before it Rage will eventually become a franchise. Id has “about a billion” different ideas that either didn’t make it into the original or could be used in a potential sequel. Before even that happens, though, the studio has another focus: Doom 4. The much-anticipated game is already in the works—while it may take some influences from Rage, expect to see something different as well.